Lammergeyer (Germ. Lammer, lambs, and Geier, vulture), or Bearded Vulture (gypaetus barbatits, Cuv. ), the largest of European birds of prey. It is about 4 ft. long and 9 or 10 ft. in extent of wings; the head and neck are completely clothed with feathers, and the cere is entirely hidden by projecting bristles; the bill is long and strong, straight, laterally compressed, with the tip curved and sharp; a tuft of stiff bristles projects forward like a beard from the base of the lower mandible; the wings are long, the second and third quills nearly equal and longest; tail lengthened and wedge-shaped; tarsi short and covered with feathers; toes moderate, the anterior ones united at the base by a membrane; claws curved, especially those of the inner and hind toes, and not well adapted for seizing and destroying prey. In the adult, the upper part of the head, the neck, and the under parts are whitish tinged with orange, deepest on the breast; the wings and tail are grayish black, the wing coverts dashed with orange white; the back deep brown; the beard and space including the eye and cere black; bill horn-colored. There is only one well characterized species, which inhabits the mountains of Europe, Asia, and northern Africa, especially the Alps and Pyrenees. Lammergeyers are seen usually in pairs; they feed on lambs, goats, chamois, etc, which they attack in such a manner as to cause them to leap over precipices, when they descend and devour the mangled carcasses; they also eat carrion. The nest is made upon inaccessible rocks, rarely upon lofty trees, several feet in diameter and of coarse materials, and the number of eggs is two or three. 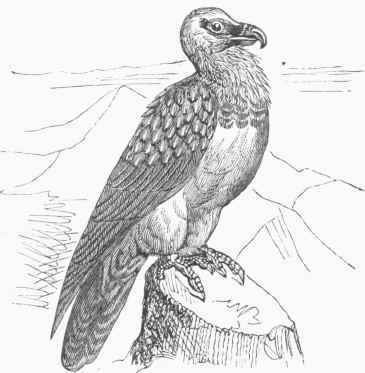 This bird plays the same part in the old world as the condor does in the new, and is very destructive to the flocks of the Alpine valleys; stories are numerous, though not well authenticated, of its having carried off children. It is not abundant anywhere, and is rarely seen in Europe north of Germany. The African bird (G. meridionalis, Brehm) and the Asiatic (G. Himalayanus, Hutt.) are probably only varieties of the bearded vulture.